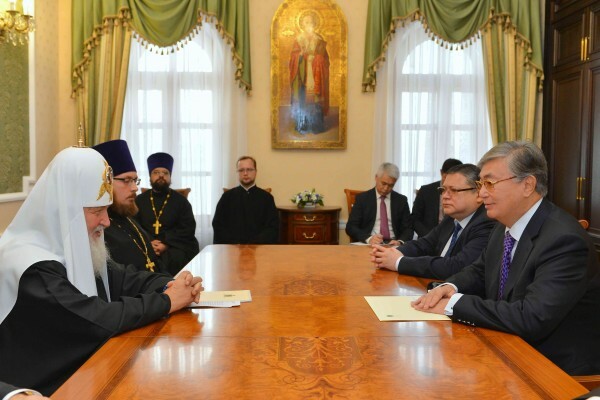 On October 14, 2014, His Holiness Patriarch Kirill of Moscow and All Russia met with Kazakhstan’s Senate Speaker K. Tokaev, at the St. Sergius Laura of the Trinity. Greeting Patriarch Kirill, Mr. Tokaev conveyed to His Holiness greetings from Kazakhstan’s President N. Nazarbaev. His Holiness told the high guest about the celebrations held by the Russian Orthodox Church to mark the 700th birthday of St. Sergius of Radonezh and thanked Kazakhstan’s leaders for their assistance in opening a monument to the Abbot of the Russian Land in Astana. Patriarch Kirill said that as for as inter-ethnic and interreligious relations, Kazakhstan is a “place of tranquillity” in the post-Soviet space, which gives this state an opportunity for putting forward important initiatives on the international level. Among these initiatives is the Congress of Leaders of World and Traditional Religions regularly held by the country since 2003. His Holiness stated that the states of the Western world are now “ousting religion to the periphery of their life and subjecting the foundation of religions to systematic destruction”. “The West de facto rejects God and builds a society in which there is no room for God. This inevitably leads to moral relativism. In this sense, such country as Kazakhstan, which firmly stands for tradition moral values, has a unique chance to become one of the world leaders in the area of interreligious dialogue”, he said. They also considered various ways of cooperation between the Russian Orthodox Church and the Republic of Kazakhstan Government. Mr. Tokaev expressed concern for the situation in Syria as the extremist movement “Islamic State” intensified its activity. Patriarch Kirill, on his part, expressed hope that the problem of persecution against Christians in Syria and the Middle East will be raised by the forthcoming Congress of Leaders of World and Traditional Religions to take place in June 2015 in Astana. Mr. Tokaev extended to His Holiness a personal invitation from Kazakhstan’s President N. Nazarbaev to come for the Congress.